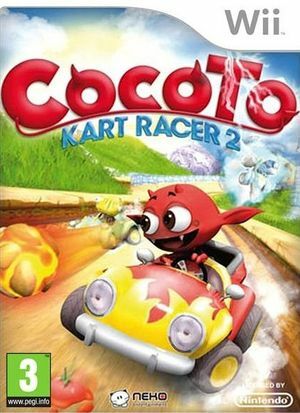 In Cocoto Kart Racer 2 the holy cauldron of Cocoto has disappeared! The Imps are in danger of loosing all their powers! Their only chance to recover them is to beat all their opponents in a series of fierce kart races to win the prize: the mysterious cauldron! Choose your pilot among twelve lively characters taken from the Cocoto universe. Collect crazy bonuses and race through 5 magical and perilous worlds! Test your driving skill in various modes: Championship, Time Challenge, or Multiplayer (up to 4 players) and unlock hidden bonus. The graph below charts the compatibility with Cocoto Kart Racer 2 since Dolphin's 2.0 release, listing revisions only where a compatibility change occurred. This page was last edited on 7 January 2018, at 05:09.